booms were a welcome wake-up call. Even after landings were switched to Florida, the occasional landing at Edwards would bring the twin boom and a flood of memories. I was a proud member of Young Astronauts in school, and I can still remember exactly where I was when I heard that Challenger had exploded after launch. I was in 3rd grade and I was playing ga-ga ball with friends. One of my friends came running out and said his mom (who worked at the school) had told him that the Challenger had exploded. We didn’t believe him. We assumed that since we could hear the sonic boom when the Shuttle landed, we’d certainly be able to hear an explosion when it launched. We weren’t really thinking that launch was 2,000 miles away. When we came back into class, our teacher sat us down and turned on the TV. We all sat there in stunned silence. It was the same feeling I had when I woke up to find that Columbia had disintegrated upon re-entry back in 2003. The general consensus seems to be that the Shuttle was an ill-advised turn for the space program, and we could have spent our resources more wisely. That’s fine and all, but as the Shuttle program comes to a close, let’s still celebrate what an incredible technical achievement it was. Whether it was the right way to go or not, everyone who worked on putting that program together should be proud of not only the technical achievement but also how the work they did pulled so many kids into dreaming about space throughout the 1980s. I really hope that we see a revitalized program with missions to the moon, asteroids, and Mars in the not-too-distant future, but I know better than to hold out too much hope. And that brings us to the topic of the week. Where would you like to see the space program go? And will it ever get there? Set a fixed annual budget and open NASA up to innovation around a long-term conversion of the space station to a solar system explorer: a modular platform that can go on extended deep space missions to asteroids, the moon, Mars, etc. and return for occasional upgrades, maintenance, refits, and resupplies. I too have many great memories about the space shuttle. I was in 7th grade when Challenger exploded and one of the science teachers in our school was a finalist to be on that mission. We were watching live when it exploded. I hate to see the rest of the world surpass us in space. I hope somewhere in Washington they figure out how to push forward. By the way Cranky…I love your blog and check it all the time….keep it up! Thanks for making me feel old today, you were in 3rd grade! I was a tad older and working at the time. I am sad the space program as we know it has ended, What goes around comes around as the saying goes, so the Russians beat us into space and they are still there, while the USA has put up a sign saying ‘out of business’. I would like to second David SF eastbay’s comments here, Brett! In addition, I am going to miss the Shuttle, too. I grew up in Tampa and, if the time of day was right and the weather was clear enough, you could see the shuttle launches (some reflected sunlight, a contrail) at the Cape clear across the state. I am not optimistic about the future of our space program at all. And, of course, I hope like hell I am wrong about that. Heck, I was 35 back then. Gee, Brett, you’re just a kid. As I wrote elsewhere, I remember Sputnick, from around 1959 or so. WE were way behind the Soviets back then. It took over a year for us to get a satellite (Explorer) launched and it discovered the Van Allen radiation belts above Earth. I remember a recent documentary that mentioned that one of our concerns was the legal issue of encroaching on (violating) another country’s air space. Sputnik essentially took that issue off the table. 10 years later we were on the moon. Quite a ride! The shuttle was born of a desire to do more practical research here at home, on Earth. Has it? Maybe not; but I feel we’re far from done in space. There will be more private participation than before but I think we’ll figure out the most cost effective way to go forward and do it. We’re not that afraid of going forward, are we? James May of Top Gear UK fame did an excellent documentary on the Apollo program that leaves you wondering where our risk taking spirit has gone. And the end of the Space Shuttle program is just another sign of this. If you have time you can find James May On The Moon hanging around online… not that BBC likes that, but… well they are there. Let’s also not forget that the International Space Station – now, and finally, complete – has already produced amazing science with definable and probably profitable benefits, and there is a LOT more to come. Too bad we have to buy seats at SCALPER prices on Russian rockets to get there……. I’m gonna be stodgy and say I want NASA to focus on scientific exploration in space. I think going back to the moon or going to mars would be nice at some point, but I think we can give it a bit of a rest now. But your photo Brett brings up memories of my trip to Space Camp in Huntsville, the original Space Camp, not that inferior copy. I flew as an unaccompanied minor on Delta. (My first time for both DL and UM as I remember.) I connected through ATL and the flight from there to Birmingham was a 30 seater, 28 of which were unaccompanied minors. The flight attendant had to do some reorganizing the cabin to get the two adults and the two oldest UMs in the exit row. It was a great expeience even though I was in mission control somewhere. Although that week, week 23, they were supposed to start doing two missions per team so people were in both Mission Control and the Simulator. Very sad day for American space program to see such a beast as the shuttle go into mothballs. I feel for all those people who have dedicated a large part of their lives to NASA and who will be loosing their jobs. When the time is right maybe NASA will move onto better and bigger things. I wish we would just drop the fixation on manned space flight, and focus on unmanned explorers only. Manned is expensive and dangerous, and aside from a cool-factor, I can’t think of many good reasons to do it. I’m very fortunate to have been able to watch the last launch in person. 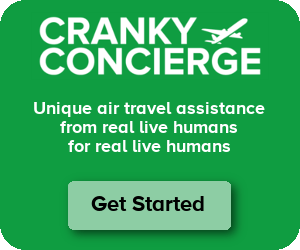 Thanks to Cranky Concierge for following my flight to MCO! I am in the same category as DesertGhost, and remember all of those events too. Being a native Houstonian my heroes were the fabulous first 7 astronauts and the movie “The Right Stuff” still is one of my favorites. I always felt that NASA was one of our prime defense arms in space. I hope that this is not the end of space exploration, however it may be the end of the government sponsorship of this entity. Hopefully my former boss, Richard Branson will be the first someone who will move us into that private sector business. I’m no expert on this subject and not American. But what would bug me most is not that the Spaceshuttle is mothballed, but that it’s not replaced by anything else and the US have to hitch a ride with the Russians now if they want to get people in space. Where should the space program go? It should be focused on science, not on expensive manned missions for the mere sake of having manned missions. There are currently satellites in orbit around the sun, mercury, venus, the earth, the moon, Mars, Saturn and an asteroid – all collecting interesting information. There’s an awful lot you can learn by sending up unmanned missions. Furthermore, I agree with the administration that it’s time to let the private sector take a bigger role with regards to getting people or satellites into near-earth orbit: some of the roles that have been played by NASA can soon be done commercially, though with some government involvement. Cranky, can you give me details on where you heard that? I have not heard such a thing from anyone, let alone a consensus. I think it’s a pretty wide consensus that the shuttle ended up being a bit of a disappointment. Simply go back to the original goals of the program, and you will see that they were not achieved. Not even close. The shuttle was not as easily re-usable as thought (the turn-around time between flights ended up high); it was too expensive to use. Suppose you want to launch a communications or weather satellite into orbit. Would you use the shuttle to do it? No, there are far cheaper options – often from outside the US. In terms of spaceflight it was an unqualified success…my biggest fear is that we will now go backwards instead of building on a great foundation…..
What Will American Do With All Those Airplanes?